We are trusted by our partners to deliver value added solutions supported by exemplary service, securing loyalty from our customers. These principles are at the core of our channel proposition and lie at the heart of our business. 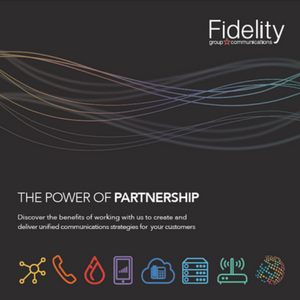 By working with us as a Fidelity partner we’ll give you access to a wealth of business and technical support and increased revenue opportunities. You’ll benefit from compelling margins and business development opportunities to enhance your business and support your customers. We have an extensive range of services to enhance your customers communications including data and hosted solutions, mobile services and IoT solutions. As our partner you’ll have exclusive access to the latest resources and our network of top tier vendors to enable you to offer your customers an industry leading portfolio of bespoke communications solutions. Benefit from a compelling margin share and an opportunity to drive new digital revenues with unique product offerings. Relationships with our vendors are second to none. Leverage our relationships with top tier suppliers to provide the perfect solutions for your customers. Our extensive product suite gives you a competitive advantage to attract new customers and create new opportunities within your existing customer base. As a small business, it’s a costly process to set up all the appropriate systems for billing large customers, monitoring orders, installations, issues and customer history. Fidelity’s billing platform, Anvil, does all of this for us. Fidelity, not only provides comprehensive training, but regularly updates us with new Anvil features including reducing risk by credit checking customers for us. We appreciate the exceptional support from the Fidelity teams supporting our business growth. As a channel-centric business, we are always looking for innovative new ways to add value to our 700+ reseller partners. We see Fidelity eLearning as a huge opportunity for revenue growth. We’re keen to engage our partners and their customers across Europe in the value and opportunity that lies within online education and training. We have long standing relationships with all major UK communications vendors, including Platinum Partner status with Gamma Telecom, JUC status with O2 and Global Partner status with Telefonica. Fidelity Group is powered by ANVIL, our award-winning proprietary software that sets us apart from the competition. The Power of Partnership – discover how our partner programme can help you transform and grow your business.